Motacilla troglodytes Linnaeus, 1758, Sweden. 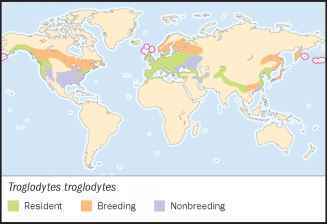 44 subspecies recognized. 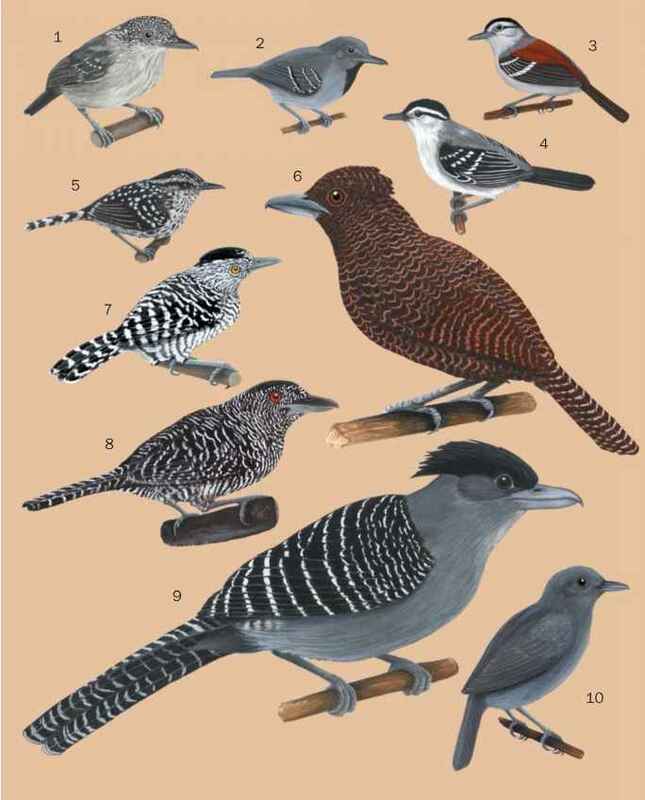 English: Wren, northern wren, holarctic wren; French: Troglodyte mignon; German: Zaunkönig; Spanish: Saltapared Invernal, Cochin. 3.6-4 in (9-10 cm). Weight 0.26-0.39 oz (7.5-11.0 g). A very small, short-tailed, and heavily barred wren. Upperparts are warm dark brown, with conspicuous narrow dark bars on wing and tail feathers. Chin and throat are grayish brown, becoming more reddish lower; flanks are deep reddish brown with darker bars. Eyes are brown; bill is brown with paler base; legs brown. Sexes are similar. Juvenile has obscure mottles on chest, and flank bars are less distinct. The most widespread of the wrens, found in four continents. North America, breeding range from Alaska, the Aleutian Islands south in mountains to California, eastward across Canada to Newfoundland and south in mountains to Georgia; winter to northern Mexico. Old World from Iceland and Scandinavia south to Spain, Morocco, Algeria, and Libya; eastward to Russia, Caucasus, Turkey, and Iran; central Asia from Afghanistan to eastern Siberia, Japan, China, and Taiwan, including many offshore islands in Europe and east Asia. Extremely varied habitat. In North America, occurs most often in cool forested areas, especially coniferous. In Europe and Asia, occurs in various types of bush and woodland, including deciduous woods with extensive undergrowth; also in suburban areas and treeless offshore islands with low scrubby vegetation. Sea level to 13000 ft (4000 m) in central Asia. Territorial in breeding season, but will sometimes roost communally in winter, with several dozen birds crammed in layers into a suitable cavity. Spends most of time down in vegetation, hopping mouse-like through dense tangles; flights are always low and short, between adjacent cover. Song is loud and vehement, a prolonged series of trills and clear notes, much sweeter and purer than song of the house wren. FEEDING ECOLOGY AND DIET Not known. Nest is a domed structure with side entrance, usually in dense vegetation or cavities; island races may nest in crannies in rock-faces or ruined buildings. Eggs number five to eight, rarely three to nine. They are white with red-brown speckles; some Aleutian races may lay white eggs. Incubation is by the female for 16 days; young are fed by both parents for 14-19 days. Usually double-brooded. Polygyny is frequent but varies among races. Males build many surplus nests; the female selects the one to be used for breeding and adds the lining. Not threatened. Generally common or abundant over much of its range; populations in Britain fluctuate wildly, being decimated by a severe winter but bouncing back very rapidly. Some island races have very small populations that may fluctuate quickly.